Should a book mention sources that are opposed to its thesis? That depends on what kind of book it is. If it just seeks to present a certain view, and makes no claim regarding the existence of other views, then it doesn't need to mention those opposing views. But certainly if a book is attempting to be any kind of definitive guide to the range of legitimate views, and there are views that are ostensibly legitimate and yet are outside of the range permitted by the book, then it should mention them, and account for them. I consider this paragraph to be deceptive in the extreme. It purports to justify the omission of sources that “may” contradict “some of” his theses. But there is no justification for his omission of sources that do contradict his fundamental thesis, as I shall now explain. Rabbi Meiselman’s book is a whopping eight hundred pages long. The description on the inside flap notes that “Thousands of references, including a vast amount of primary source material, make this an invaluable resource for anyone interested in investigating the issues on his own.” The constant theme of the book is that Chazal’s definitive teachings about the natural world are never in question, and the chachmei haMesorah have never said otherwise (see e.g. p. 261). The goal of the work, as discussed on p. xxii (and explicitly described there as the goal of the work), is to show that “there is no support in the classical sources” for the approach to Chazal and science that is presented in books such as mine. In other words, he does not just want to show what is the “mainstream” approach, as he claims in the paragraph above; instead, he wants to entirely negate the legitimacy of the approach that is presented my books. But given that he writes a vast amount of material, and presents thousands of references, and especially given the fact that his goal is specifically to address and rebut the approach of my books, and to claim that it has no support amongst the chachmei hamesorah, it is all the more remarkable that Rabbi Meiselman does not acknowledge the existence of several of my most important sources! • Most of the Rishonim, and many Acharonim, are of the view that Chazal were mistaken with regard to the sun’s path at night. As demonstrated in an earlier post, Rabbi Meiselman tries to downplay the views of the Rishonim, refusing to quote or explain their position on this topic. And he does not acknowledge the existence of various Rishonim and Acharonim, such as disciples of Chasam Sofer, who, in commenting on this topic, make general statements about how Chazal were simply not expert in scientific matters and thus sometimes erred. • Rav Shimshon Raphael Hirsch is one of the most important Jewish figures of the nineteenth century. His letters on Chazal and science are the most extensive pre-20th century discussion of the topic. He occupies a prominent position in the manifesto of the approach that Rabbi Meiselman is attempting to refute. He discusses at length the case of the mouse that Chazal describe as growing from dirt, which Rabbi Meiselman has a chapter on. But Rabbi Meiselman makes no mention of Rav Hirsch’s writings on this topic! And he quotes Rav Hirsch’s skepticism of evolution from a scientific standpoint, without quoting his statement that evolution presents no theological problem! • The topic of spontaneous generation is one of the most significant in the Chazal-science discussion, and Rabbi Meiselman has a full chapter on it. Rav Moshe Shmuel Glasner, Chief Rabbi of Klausenberg and the author of the seminal work Dor Revi’i, is one of only three pre-Holocaust gedolim to address this conflict; it also addressed by Rav Herzog, who is quoted elsewhere in Rabbi Meiselman’s book and is thus an authority that he takes seriously. But Rabbi Meiselman makes no mention of the view of Rav Glasner and Rav Herzog regarding the spontaneous generation of lice! There are further examples of how Rabbi Meiselman omits inconvenient sources. I shall discuss them in the course of future posts. My book Sacred Monsters is only half the length of Rabbi Meiselman’s book, and much of it is not dealing with conflicts between Chazal and science. Yet I manage to quote the full range of views on this topic; it’s really not too difficult. All it takes is the honesty and humility to acknowledge that there have been great people in history who take a different view from one’s own. It is a pity that Rabbi Meiselman cannot do this. I would guess Dovid Kornreich. As the Rav surely knows the paucity of scientists who cite contrary points of view or data which would contravene their works is well documented. So, it is not surprising to me to find similar tactics with an author who believes he is saving his audience from heretical views by omitting them. But your points about intellectual honestly strikes a chord. I wonder if Rabbi Meiselman himself believes he is in fact being intellectually honest, or if he simply doesn't care about such a quality. "to claim that it has no support amongst the chachmei hamesorah, it is all the more remarkable that Rabbi Meiselman does not acknowledge the existence of several of my most important sources!" What is so remarkable? You just answered your own question. Apparently, Rabbi Meiselman does not rank your most important sources as being among the "chachmei hamesorah". I believe this is the more relevant issue which needs discussion--how to evaluate which source is more authoritative. Indeed, what value is there in quoting the Dor Revi'i or Rav Herzog if their opinion is not generally considered to be authoritative by most professional talmudists and halachists? And I'm afraid being a good researcher of little-known or "non-mainstream" opinions (another concept which needs definition) will not be an asset in that crucial evaluation. In fact, I think it would hamper it. The Dor Revii is one of the most authoritative seforim ever written on Masechta Chulin, and is quoted many times in the Artscroll Shas. R Slifkin, since so much of the controversy surrounds the concept of the Gadol and the nature of rabbinic authority, maybe you're next book can be on that topic? There are good scattered articles around, like Dr. Chaim Soloveitchik's famous article, or the articles in the YU forum books, or the Uses of Tradition book etc. But it would be nice to have a whole book dedicated to the concept of the Gadol and daas torah. As the Rav surely knows the paucity of scientists who cite contrary points of view or data which would contravene their works is well documented. A big statement, do you have any evidence to support this? I would hazard a guess that most peer reviewers of scientific works would eviscerate any work that ignored previously published work. First, that would be a valid argument, were it not for R' Slifkin pointing out that R' Meiselman quotes R' Herzog elsewhere in the book - meaning that R' Meiselman does not consign R' Hertzog to the ranks of "non-authoritative sources" and affirmatively considers him one of the "Chachmei HaMesorah". Of course, as someone who has the book, I am certain you would tell us if this isn't true. Second, in the absence of R' Meiselman providing a metric (beyond "can R' Meiselman harmonize their comments with his position") for identifying "Chachmei Hamesorah" (as distinguished from mere Torah giants such as the Dor Revi'i, R' Herzog, and R' Hirsch), this seems to be nothing more than a tautological application of the No True Scotsman fallacy; if you define "Chachmei HaMesorah" as "people who can be harmonized with R' Meiselman", then of course all the Chachmei HaMesorah follow that approach and none don't. It becomes a useless point without any rhetorical force. Not to mention the fact that surely Rav Glasner and Rav Herzog were themselves "professional talmudists and halachists"! Fiery Chulent, apart from the poor English in the announcement of RMM's shiur, it is written in two inconsistent voices. E.g., "my involvement with Slifkin" is written in RMM's voice, while "the Rosh Yeshiva's ground-breaking book" is written in a student's voice. That sort of sloppiness in the composition of a public notice reflects poorly on the sophistication and literacy of the Toras Moshe student body, which is probably typical of RMM's target audience in general. The juvenile scrawls on the announcement tend to reinforce that impression. That's probably why, in his own circle, RMM can get away with the questionable scholarship and intellectual dishonesty Rabbi Slifkin has been calling to our attention. It's a classic case of ראש לשועלים. If the sign is about a speech being given by Dovid Kornreich, as NS guessed it was (which is obvious from the fact that he references his involvement in the blogosphere) then your critique of the POVs used is incorrect and inappropriate. As for the "juvenile scrawls"...have you ever written on something that was posted on a wall? It doesn't come out neatly. And if only a hundred talmidin are going to see it, you don't mind either. Well, at least you are starting to ask the right questions. If you saw why quotes Rav Herzog and the context he quotes him in, you will see how it proves my point. He cites him in order to explain how non-authoritative and non-mainstream his approach to lice is by relying on Rav Avraham ben HaRambam! Rabbi Slifkin is entirely missing the point about how to evaluate the authoritative nature of an opinion. He apparently thinks anyone who published a sefer or wrote teshuvos has equal weight on par with everybody else-- and against everybody else! How many people have heard of the Dor Revi'i before Rabbi Slifkin "discovered" him two years ago? Even Rabbi Slifkin never heard of him until an rabbi specializing in research brought him to his attention! He provides a metric. Read the book. Don't rely on a prejudiced and dedicated critic to present the metric and analyze it objectively. Especially when the entire topic of weighing the authoritative nature of sources will undoubtedly serve to undermine the critic's legitimacy. To "Someone who has the book"
What impoverished backwater of Torah awareness do you come from? There's hardly a lamdan or posek worthy of the name who isn't familiar with R. Moshe Shmuel Glasner, the Dor Revi'i. From his magisterial peirush on Mesekhet Hullin to his foundational teshuvot on hilkhot mikvaot (among other topics) he is a world-class gaon of the highest rank. He's perhaps lesser known among the chattering classes because, like other unabashed Mizrachists, he has been systematically marginalized. But that's a fate he shares with other undisputed gedolim who suffered the the same loss popular recognition on account of Zionist leanings, sympathy for educational reforms, etc. R. Dovid Karliner, an undisputed gadol hador, comes to mind. The small-mindedness and constricted kavod haTorah it takes to write such giants off is staggering. And let us not forget that if RMM had remained true to the mesora of his side of the Brisk dynasty, he'd be a marginal figure in the very circles he moves in today. who pronounced him one of the world’s outstanding Talmudists. At his funeral, Rav Aharon Kotler gave a hesped, and referred to him as a “prince,” and spoke of his extraordinary Torah scholarship. Rav Herzog’s group of disciples included Rabbi Yechezkel Abramsky, Rabbi Shlomo Zalman Auerbach (whose work Ma’adanei Aretz bore the approbation of Rabbi Herzog), Rabbi Shmuel Wosner, and Rabbi Yosef Shalom Elyashiv. And, of course, he was the Chief Rabbi of Palestine and of the State of Israel, succeeding Rav Kook. It is either sheer ignorance or unabashed chutzpah to both Rav Herzog and to the people named in the above paragraph to claim that Rav Herzog was not a professional Talmudist or halachist, or otherwise not a voice that is entitled to be heard in a Torah-science discussion. 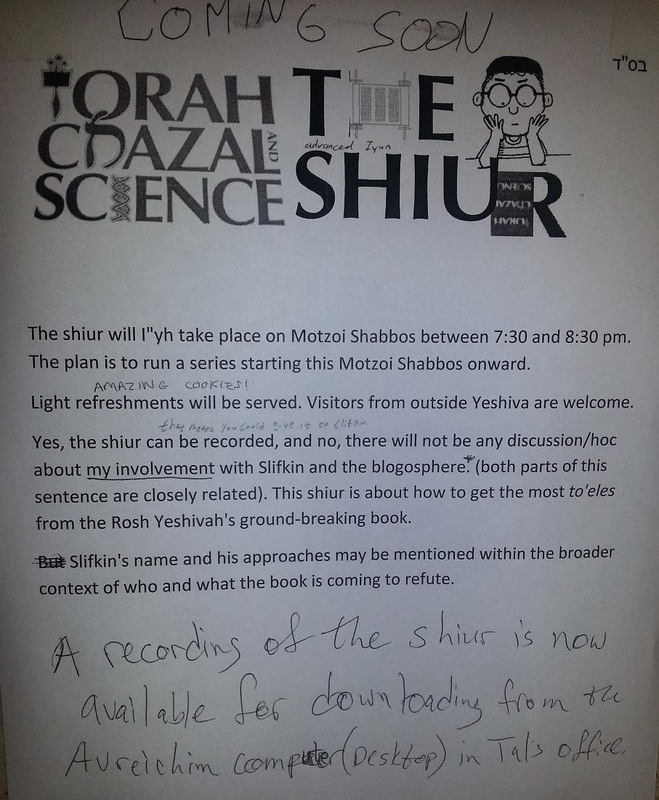 "How many people have heard of the Dor Revi'i before Rabbi Slifkin "discovered" him two years ago?" How many people have heard of Rabbi Moshe Meiselman? E.g., "my involvement with Slifkin" is written in RMM's voice, while "the Rosh Yeshiva's ground-breaking book" is written in a student's voice. I think that both are R. Kornreich's voice. R. Meiselman is not involved in the blogosphere. The shiur is not R. Meiselman's (AFAIK). The book hasn't arrived yet, but it is unfortunate that he omits those sources. I really would like to know what he does with them, even though I would be likely to disagree. You know, I wouldn't have written something so mean-spirited if you hadn't just gone and taken your little teenage hand and waved it with all of the childish nonchalance you could muster in the face of people that would eat you and everyone you've ever met in learning. Now I will admit that everyone goes through stages like this, but it's often useful to have someone "help you along" through it with a sharp remark. So from now on, blithely asserting what "everyone knows" about who's a real "Talmudic professional" is a no-no, mkay? IIRC, RM Feinstein gives an exceptionally lavish Haskama on Responsa G4 v. I. If Kornreich is hopelessly snarky in presenting his anti-science online screeds. If he is anything like that in person, then he should be sure to alienate anyone attending his shiur that is the least bit capable of critical thinking. "It is either sheer ignorance or unabashed chutzpah to both Rav Herzog and to the people named in the above paragraph to claim that Rav Herzog was not a professional Talmudist or halachist, or otherwise not a voice that is entitled to be heard in a Torah-science discussion." Once again, Rabbi Slifkin is entirely missing the point about authoritativeness. But when they are an isolated small minority going against the approach of virtually everyone else before and after who did address the issue of Chazal vs. science, then their authoritative status simply dissolves and they become irrelevant. ways. He can't play the rabbi and tell people (effectively paskening) that these isolated opinions are legitimate to follow, and when called out on that because they aren't authoritative enough to go against the mesorah, suddenly switch to being an academic and complain that they have "a voice" which ought to "be heard" in a "discussion". Indeed, Rabbi Meiselman's book is not an academic "discussion" of the sources on the topic. It is an attempt to ascertain which opinions have become authoritative and which approaches are not legitimate. But that's the point. There were very, very, very few who addressed the issue of Chazal vs. science. The authorities that I cited are not remotely the minority. Or, to put in another way: You're rely on R. Meiselman's authority to say what the "acceptable" position is, based on the mesorah. But Rav Glasner and Rav Herzog say that the acceptable position, based on the mesorah, is quite different. In a contest between R. Meiselman and Rav Glasner/Rav Herzog, who do you think wins? Furthermore, if you want to disqualify minority views, then since absolutely every Rishon and Acharon said that Chazal were talking about spontaneous generation, and only Rabbi Meiselman says they weren't, shouldn't HE be disqualified? I should also point out that two major figures of halacha in the Modern Orthodox/ Y.U. orbit feel the same regarding Rav Glasner's lack of authoritativeness in this area. Rav Bleich is as guilty as Rav Meiselman of omitting inconvenient sources. And Rav Schachter simply disagreed with Rav Glasner, which he is perfectly entitled to do; he didn't rule him out of Judaism! Incidentally, it's ironic that you quote Rav Schachter, since Rav Schachter very clearly disagrees with Rabbi Meiselman! "But that's the point. There were very, very, very few who addressed the issue of Chazal vs. science. The authorities that I cited are not remotely the minority. "Rabbi Bleich then explains that Rav Glasner's view is a singular position, and that he is "rejecting the views of numerous highly-respected and more authoritative predecessors." He adds that "Halakhic decision-making is not a matter of picking and choosing among precedents consigned to the cutting floor of Halakhah. It most certainly does not consist of seeking resolutions unencumbered by “unappealing consequences” and then engaging in sophistry to justify those resolutions." "Or, to put in another way: You're rely on R. Meiselman's authority to say what the "acceptable" position is, based on the mesorah. But Rav Glasner and Rav Herzog say that the acceptable position, based on the mesorah, is quite different. In a contest between R. Meiselman and Rav Glasner/Rav Herzog, who do you think wins?" I didn't notice in any of your citations of these two sources that they list members of any vast mesorah. Rav Herzog lists a total of one authority and claims it represents the entire literature. Rav SZ Aeurbach said explicitly it is a minority view by implication of the vast majority of poskim who do never say Chazal were in error and give alternative solutions to the conflict with science under discussion. Rabbi Meiselman actually documents where this mesorah comes from in the rishonim and gedolei achronim. I suggest you try to analyze where Rabbi Meiselman gets his mesorah instead of playing childish games like "my mesorah can beat your mesorah". I have documented R. Bleich's intellectual dishonesty in several posts. R. Meiselman gives very, very few sources that address this. The bottom line is both Rav Glasner and Rav Herzog were outstanding Torah scholars and rabbinic leaders who were also two of the very, very few authorities to actually address the topic of lice. There is no justification for omitting their viewpoint and/or claiming it to be illegitimate. What metric does he provide? Because any metric that relies on dismissing R' Avraham B' HaRambam as a forgery is inherently untrustworthy. It is an attempt to ascertain which opinions have become authoritative and which approaches are not legitimate. You honestly don't see the difficulty with declaring R' Herzog, the Dor Revi'i, R' Hirsch, et al. "not legitimate"? He didn't say "sources that may contradict". He said "there may be sources that do contradict". Not true. R. Shlomo Zalman Auerbach was not even sure whether anybody had ever argued with the premise that Chazal could err scientifically. He certainly did not think that the majority view was that Chazal were scientifically infalliable. Lakewood Strong, I hope you are a professional writer, because that was fantastic. Are other samples of your prose available online? והלום ראיתי בס' נשמת אברהם פי"ד ס"ד שמביא דברי רב שרירא גאון ור' אברהם בן הרמב"ם ומנה ענין זה כאחד מן הטעמים שאין להשתמש ברפואות המובאות בתלמוד. והגרש"ז איוערבאך שליט"א העיר ע"ז (בריש הספר) דנכון היה להביא שיטה זו בשם "יש אומרים" והעיקר הוא כשאר הטעמים. ושאלתי להגרש"ז שליט"א מי הוא זה שחולק על דברי רב שרירא גאון ור' אברהם בן הרמב"ם. וכתב לי וז"ל: כעת אינני זוכר אם יש מישהו שממש חולק או אפילו אם יש מישהו שיכול לחלוק עליהם, אך יתכן שכוונתי דהואיל ורבים כתבו הטעם של שינוי הטבע ולא הזכירו כלל מפני שיפור הידע בדרכי הרפואה בזמנינו, לכן העירותי שראוי לכתוב בשם "יש אומרים", ובפרט שבעניני שבת יש שמתירים מלאכת שבת אף שלדעת הרופאים אין שום סכנה, עכ"ל.
I saw in the book "Nishmat Avraham" 14:4 that he quotes the statements of R. Sherira Gaon and R. Avraham ben Harambam [that when Chazal discussed natural science they based themselves on the knowledge and beliefs of their times, which were not necessarily correct], and listed this as one of the reasons not to employ the medical remedies discussed in the Talmud. And [I saw] that R. Shlomo Zalman Auerbach commented that this view ought to be introduced with the words "some say," the other reasons [for not using the Talmudic remedies] being primary. I asked R. Shlomo Zalman [Auerbach], who is it who disagrees with the statements of R. Sherira Gaon and R. Avraham ben Harambam? R. Shlomo Zalman Auerbach replied, "At this time I do not remember if there is anyone who actually disagrees, or even if there is anyone who can disagree, with them. However, perhaps what I meant was that since many wrote [that] the reason [for not using the Talmudic remedies] is that nature changed, without mentioning the improved medical knowledge of our times as a reason at all, I therefore commented that it would be appropriate to cite that view with the words "some say;" especially since in matters of Shabbat [violation for the sake of the ill] some permit the performance of melacha on Shabbat even if the medical community believes that there is no threat to life." Where is the quote of RSZA found? So, as much as I hate to say this, "Someone..."'s interpretation of RSZA seems to be correct - from the statements of the "rabim" who give the shinui hateva approach RSZA is inferring that they disagree with the rationalist approach here, and that the rationalist approach is a "yesh omrim" - ie, a secondary view. Of course, he didn't seem very definitive or passionate about it, as he is only conjecturing that he in fact made this inference. It does seem more like RSZA believed in the anti-rationalist approach a priori, and when pressed on the matter had to come up with a post facto justification. I also don't understand his last point that the fact that poskim allow one to do melacha on shabbos in cases where doctors don't believe that it's pikuach nefesh yet chazal did somehow implies that chazal knew their science. Even according to the anti-rationalist approach presented here, there was shinui hateva after chazal made their statements, so either way it shouldn't be considered pikuach nefesh. Truth be told, I regret writing that comment. It was quite snarky and mean, and probably didn't accomplish what I'd intended it to. In fact, I ask mechila from "someone who has the book" for having written so sharply. I could have just gotten to the point and said "don't dismiss people greater than yourself and those you know." I read it a bit differently. I have heard that Rav Auerbach is also known to have said that had Rabbanim known how electrical devices work, they would not have forbidden their use on Shabbos. But, now that it's Minhag Yisroel not to use electricity on Shabbos, we shouldn't try to change it. Based on that, I'd say that his intent here is that we rely on the opinions that Matir Issurei De'Ohraisa, but if we were to relegate the "Yesh Omrim" to primary status, we'd have to curb our actions, and probably lead people to be Michalel Shabbos with no Heter. Thus, even though no one explicitly disagrees with their view, it is not proper to use this as a basis to change contemporary Halachah. RSZA clearly states that it is quite possible that no one at all argues with R. Avraham ben Harambam and R. Sherira Gaon. That, I believe, is conclusive. RSZA calls R. Sherira Gaon's view a minority view because he is assessing the use of Talmudic remedies from a purely halachic perspective. Most halachic authorities who counseled against using the Talmudic remedies did so for reasons other than the remedies' scientific incorrectness. Therefore, in a halachic discussion, the "scientific incorrectness" approach is a minority view. But nothing can be inferred from this about the general question of whether Chazal could make scientific errors. One can believe that Chazal could at times be scientifically incorrect, and simply not believe that they were scientifically incorrect about their remedies. The fact that it is a minority view regarding remedies tells you nothing about whether in general it is a minority view that Chazal could have been in scientific error. And RSZA isn't sure whether anyone does, or even could, assert that Chazal were always right. Anonymous, the quote from RSZA is in a letter quoted in Shemirat HaGuf v'HaNefesh, Chapter 6 of the Introduction. Thank you DES - I would tend to agree with your interpretation given the broader context of this quote in which RSZA is concerned with whether to apply the general opinion of R Shrira Gaon and R Avraham ben HaRambam regarding chazal and science in general (which, as you point out, he seems to have no objection to) to the localized issue of refuos. I still don't understand the consistency with the last bit about pikuach nefesh - even if we don't apply R Shrira's approach to refuos, we still should not be justified in being mechalel shabbos, as the alternative approach in shinui hateva, in which case there is still no real pikuach nefesh. I think RSZA's final point is that there are those who believe that we should be choshesh for Chazal's medical advice since it is a matter of pikuach nefesh, even though their advice does not appear to be correct (at least nowadays); the existence of those opinions is a further reason to present the view of R. Avraham ben Harambam and R. Sherira Gaon as a minority opinion for the purposes of a halacha lema'aseh discussion.